Richmond City Hall is located at 402 Morton Street, Richmond, TX 77469; phone: 281-342-5456. Photo: Lamar-Calder House, ca. 1854, 915 Front Street, Richmond, TX. 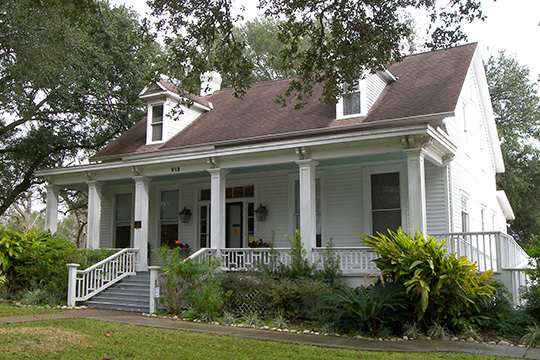 Listed on the National Register of Historic Places in 2005. Photographed by user:Larry D. Moore (own work), 2008, [cc-by-3.0 (creativecommons.org/licenses/by/3.0)], via Wikimedia Commons, accessed May, 2015. William W. Little led a group of members from Stephen F. Austin's Old Three Hundred in establishing a settlement at a bend in the Brazos River in 1822. It was the nucleus of a settlement known as Fort Bend (The Fort Settlement). Richmond was established by business partners Robert Handy and William Lusk in 1837. It was named for Richmond, England. Later that same year Fort Bend County was formed and Richmond was designated as the county seat. In 1839 a Methodist Episcopal Church was organized as well as the town's first newspaper, the weekly Telescope and Texas Literary Register. By 1851 the town included a brick courthouse, 2 stores, a Masonic Hall, the Methodist Church, and the Richmond Male and Female Academy. Prior to the Civil War, Richmond developed as the center of the "cattle empire" that grew between the Brazos and Colorado rivers; cattle were branded west of the town before being sent north to market centers in the Midwest. In 1878 the Gulf, Colorado, Santa Fe Railway extended tracks through the area, but bypassed Richmond. City of Richmond, Texas, Richmond History, www.ci.richmond.tx.us, accessed August, 2012.